This vehicle is a very rare beast indeed! The Badger was principally a goods chassis whilst the bodywork is the oldest Plaxton bus body in existence. 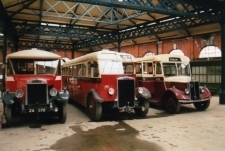 Plaxtons were (and still are) located at Scarborough, one of a number of UK coachbuilders to have set up in coastal resorts to utilise available local labour outside the peak holiday season. 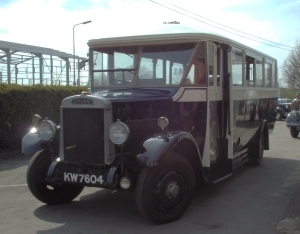 This little petrol-engined bus spent its entire working life with Bradford Corporation, being used for educational activities up until 1962, when it was bought by the Society. 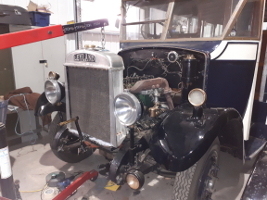 It is one of a number of vehicles in our collection to have appeared in period film and television dramas; being transported to Ireland for the filming of Angelas Ashes in 1998. It ventured outside the county for the first time in many years in April 2007 to participate in the Plaxton 100 celebrations at Scarborough. October 2017 - Work continues - and the head has been re-fitted. 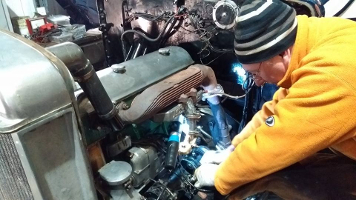 April 2018 - Work on the Badger's engine was completed in Spring, and the Badger returned to the road as an unscheduled extra at the Easter Transport Festival event.